“We worked so hard in the game, we need those decisions,” the Northern Irishman added. 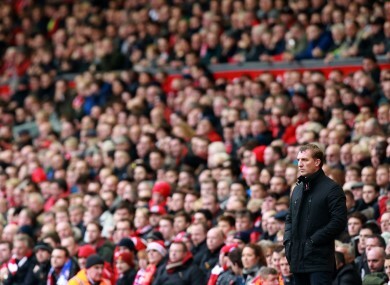 Liverpool manager Brendan Rodgers on the touchline. LIVERPOOL MANAGER BRENDAN Rodgers complained that his team were denied what he called a “clear penalty” during their 2-1 loss at home to Premier League leaders Chelsea on Saturday. Chelsea took the spoils thanks to a close-range strike by Diego Costa in the 67th minute, after Emre Can’s early opener for Liverpool had been cancelled out by Gary Cahill. Defeat left Liverpool 15 points off the pace in the table, but Rodgers felt that his side should have been awarded a penalty after a late Steven Gerrard strike appeared to catch Cahill on the arm inside the box. “It was a clear one,” Rodgers told BT Sport. “We worked so hard in the game, we need those decisions. Liverpool have now lost five league games this season – just one less than they recorded in the whole of the previous campaign – and Rodgers hopes the return from injury of striker Daniel Sturrige will give them a boost. “We have got to keep working hard,” the Northern Irishman added. Chelsea remain unbeaten this season and manager Jose Mourinho felt that his side were deserving victors at Anfield. On Liverpool’s late penalty claim, he said: “Too far for me (to see). I don’t know. But the victory is very much deserved. Email “Rodgers fumes after Liverpool denied 'clear' penalty”. Feedback on “Rodgers fumes after Liverpool denied 'clear' penalty”.